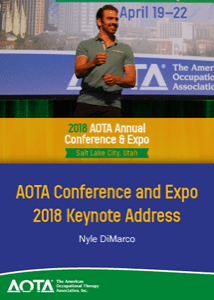 Join Nyle DiMarco, winner of “Dancing with the Stars” and “America’s Next Top Model,” as we kick off AOTA’s 2018 Annual Conference & Expo! Nyle is an advocate for American Sign Language; Honorary Spokesperson for Language Equality and Acquisition for Deaf Kids (LEAD-K); and Founder of the Nyle DiMarco Foundation, which works to improve the lives of deaf people around the world. Believing that his deafness is “an asset rather than a limitation,” he will share his occupational journey and how with a sense of community, commitment to your goals, and belief in yourself, you can accomplish anything.